What’s killing American beech trees? American beech leaf disease is killing trees in northeast Ohio as well as in Pennsylvania, New York and Ontario. COLUMBUS – American beech trees are dying in northeast Ohio and beyond. An Ohio State University study aims to figure out why. The study is looking into the cause of beech leaf disease, which was first found in Lake County in 2012 and has since spread to nine other counties in Ohio, eight in Pennsylvania, one in New York and five in Ontario. Young trees seem to be particularly susceptible to the disease, which initially causes dark stripes to appear on leaves, then deforms the leaves. Eventually the disease can kill the trees. “There’s no similar forest tree disease that we are aware of anywhere,” said Enrico Bonello, a professor of plant pathology in Ohio State’s College of Food, Agricultural, and Environmental Sciences (CFAES), who oversees the study. Working under Bonello’s supervision, doctoral graduate student Carrie Ewing is comparing the genes of microorganisms present in leaves that have symptoms of beech tree disease and those that do not, hoping to identify the microorganisms that are uniquely associated with beech leaf disease. She’s trying to determine whether the mystery microorganisms causing the disease are viruses, fungi, bacteria, phytoplasmas or nematodes. Phytoplasmas are bacteria without cell walls. Nematodes are microscopic worms. If the infected plants have genetic material from a specific microorganism that the uninfected plants don’t have, Ewing then can zero in on the suspected pathogen and inoculate healthy trees with it in an attempt to prove that the pathogen is the cause of beech leaf disease. Ewing expects to have study results by this summer. Meanwhile, the U.S. Forest Service and researchers with Lake County’s Holden Arboretum in Kirtland are conducting a separate study on potential causes of the disease. 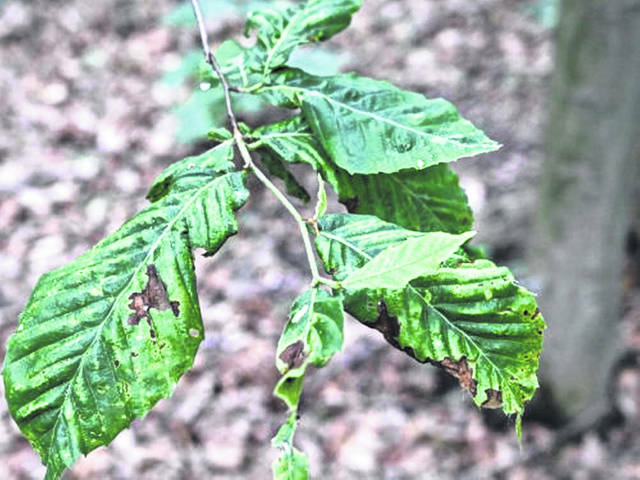 They are looking into whether nematodes found two years ago on infected beech leaves are causing the disease or if they were just present on infected leaves. Ohio has 17 million American beech trees, and many of them in northeast Ohio, particularly along or near Lake Erie, are afflicted with the disease, Bonello said. The disease was first reported on American beech trees, the only beech trees native to North America, but similar symptoms have been found on European beech and Oriental beech trees in nurseries in Lake County, where beech leaf disease was first found. Submitted by Ohio State’s College of Food, Agricultural, and Environmental Sciences.